Hello, my name is Sam Kimmel. 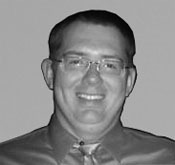 I am a web application developer and IT manager located in the Madison, WI area. For the past 14 years I have been creating user-friendly dynamic web applications. My web development career began as a side-project; creating a time-tracking solution utilizing classic ASP and Microsoft Access. When I saw how useful my creation was to others, and had a taste of what was capable with web technology and a little creativity, I never looked back. I currently specialize in the Microsoft stack (IIS, Visual Studio, ASP.net, C#) and use it to create reliable and high-performance web properties. For the past 10 years my work has centered around creating and maintaining online retail websites. E-commerce fascinates me because it moves so quickly and it always seems like you are racing to keep up with the latest trends. On top of developing a nice looking site, it has to be functional, user and search engine friendly, and secure. It is very challenging and rewarding work; you learn something new almost every day. In my current role as IT manager at a small e-commerce company I have the pleasure of wearing may hats: web developer, business analyst, database administrator, network administrator, phone system manager, and let's not forget ... technical support :) While at times the task list looks daunting, I've had the pleasure of being hands on in every aspect of the web development lifecycle and have learned a great deal. I am an alumnus of the University of Wisconsin-Madison with a Bachelors degree in Computer Science. While keeping up with technology can be a daunting task I make every effort to stay up to date. I’m an active member in the StackOverflow community, utilize Pluralsight for online training, follow key members of the ASP.net community on Twitter, read online blogs and articles, subscribe to MSDN magazine, and even manage to get a book in here-and-there. I spend many nights tinkering with trending technology to see how it may apply to my professional projects. Believe it or not, even with all the time I spend practicing web development and being a father, I occasionally have some time left over for other activities. First and foremost I love fishing. Largemouth bass is my favorite species but I also spend a fair amount of time pursuing walleye. To be perfectly honest, even if there was nothing biting a morning or evening on the water is hard to beat. I also enjoy playing basketball, golf, and guitar.